Welcome to Collectible Dolphins. Here we love these intelligent aquatic creatures as much as you do, and aim to present you with all the very best dolphin stuff for you and your home. Whether you're looking to buy gifts for a dolphin lover or a special gift for yourself, you'll find a huge selection of fabulous items range here. Plus we've got interesting dolphin facts and information so you can learn more about these fascinating creatures too. A mother dolphin teaches her baby the ways of the sea on this blue-glass carved art piece. A perfect gift for home or office. 6 1/4" x 1 1/2" x 4" high. Dolphins frolic above the deep on this collector's plate which sits on a coral design base. 7 1/2" diameter. The soft patina of pewter porpoises will be highlighted by the glow of candlelight when heating aromatic oils in this classic oil warmer. 4 3/4" diameter x 4 1/2" high. 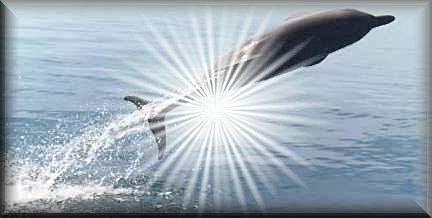 Please bookmark CollectibleDolphins.com for Collectible Dolphins and all the Dolphin Stuff you Need and much more.